The Union Ministry of Environment and Forests (MoEF) has decided to ban mining within at least one kilometre of the boundary of national parks and wildlife sanctuaries in Goa. The decision has come after the Supreme Court slammed the ministry for violating its orders by allowing mining in and around the protected areas in the state. In 2006, an order by the apex court mandated that under the Environment Protection Act, states should declare eco-sensitive zones (ESZs) around the protected areas to keep a check on their fragmentation that may result from industrial development. Mining and most polluting industries are prohibited in these zones. The court had also ordered that till the states do not identify such ESZs, all the projects that require environment clearance and are within 10 km of a protected area boundary, including mining, would be allowed only after the National Board of Wildlife (NBWL) gave approval. In an ongoing case on unregulated iron-ore mining in the state, the Central Empowered Committee (CEC), an adviser to the Supreme Court on forest related issues, had pointed out that at least 156 mining leases were granted by the ministry within 10 km of protected areas in the state, without mandatory approvals by NBWL. Of these, at least 19 leases were located within sanctuaries. However, for more than six years now, the rules have been constantly flouted. Despite repeated reminders from MoEF, very few states have sent proposals declaring ESZs, to the ministry. In December last year, MoEF even declared a deadline for states to send the proposals for ESZ, failing which the ESZ would be notified in 10 km from the boundary of protected areas. Earlier, CEC had also proposed that to avoid delay in notifying ESZs, uniform criteria should be applied to such zones on the basis of the area of national parks and sanc. For this, it classified India’s 102 national parks and 515 wildlife sanctuaries into four categories, based on their area, and proposed a safety zone of 2 km, 1 km, 500 m and 100 m from the boundary for each of the category. The ministry, however, had opposed this mechanism saying ESZs should be case specific for each protected area. 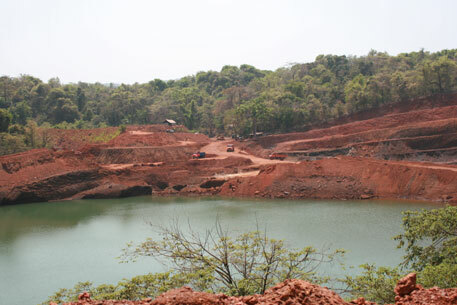 Opposing the MoEF proposal, Goa government told the Centre that 25 per cent of the state's revenue comes from mining and 30 per cent of the state's population depends on mining for livelihood. It asserted that Goa is a small state with 42 per cent of its area already protected as forests or Coastal Regulation Zone (CRZ) and the state’s economy has been affected because of closure of mining, imposed by the Supreme Court, in the past one year. The state government, thus, proposed that “natural boundaries” along the protected areas or the criteria proposed by CEC should be considered for demarcating eco-sensitive zones in the state. While the natural boundaries mentioned by the state mostly coincided with the existing legal boundaries of protected areas, going by the CEC recommendation would have meant that ESZs in the state would range between 100 metre to 1 kilometre from the boundaries. Following the state's recommendations, the MoEF constituted a committee, headed by National Tiger Conservation Authority member secretary Rajesh Gopal, in September, to inspect the six protected areas in the state and suggest the ESZs around those areas. The MoEF committee, in its report submitted on October 18, said that presence of wildlife has been reported from outside these protected areas as well and it was difficult to define a single natural boundary, as proposed by the state, as a credible demarcation for ESZ. “Several micro watersheds exist along the boundaries of the protected areas and have presence of flora and fauna; it is important to prescribe a “peripheral/buffer belt” along the boundaries of protected areas which can serve as robust eco-sensitive zones to protect such areas,” said the MoEF committee. Except Salim Ali Bird sanctuary, whose area is just 1.8 square kilometre and is surrounded by rivers from three sides and a village from one side, the MoEF committee recommended that a peripheral strip of not less than 1 kilometre radial distance from the boundaries of the protected areas should be declared as ESZ. In case of Cotigao Wildlife Sanctuary, the committee said that the ESZ may extend up to a radial distance of 3 km, to protect existing flora and fauna. The ministry, in an order issued on October 24, said it had accepted the committee's recommendations “in principle” and the draft notifications of ESZs for these protected areas will soon be issued for public comments. In four out of the six ESZs, the restrictions on mining will be imposed as soon as their final notification is in place. However, for Nethravali wildlife sanctuary and Bhagvan Mahavir Wildlife sanctuary and national park ESZs, where most of the mining leases were concentrated, mining will be phased out over a period of time to avoid sudden loss of employment for the people dependent on mining. The ministry said this was also being done to give state adequate time to put in place effective plans to reclaim the ecology in the ESZs which has been fragmented by mining. While MoEF has made up its mind, the decision will be implemented only after the apex court permission as the case is under its consideration.